I hope you all are having a good summer. July is almost over which means the summer holidays are half over for the children and yes school supplies are already in the stores. We have been having a Creative Inspiration for July here at OCS and hope you all have been inspired by the OCS Design Team gals who have done some fabulous cards. 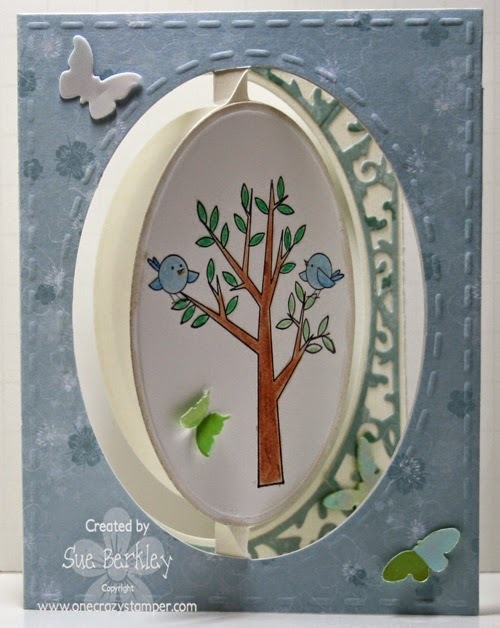 I have had some more fun playing with the Elizabeth Craft Designs Dies. 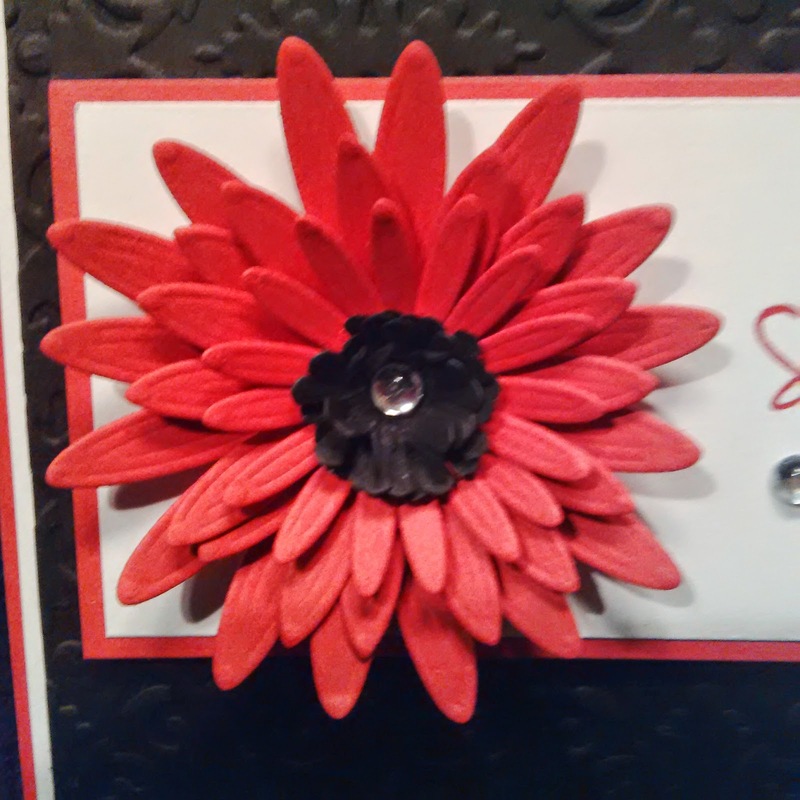 This time I used the Accordion Circle Card and the Square with Circle Frame Edges. Stop by Lora's store for any supplies that you might need or would like/want. I hope you have gotten some inspiration from the OCS DT gals. Keep crafting, and be creative while enjoying the rest of the summer. I Hope ya'll enjoy my card and are having a great summer! I know we are, we've been busy enjoying the neighbourhood splash pad, the ROM, Storybook Gardens, the beach, McMichaels art museum, the Niagara Butterfly Conservatory and now awaiting our vacation to the republic of Trinidad and Tobago! I have a birthday card that I made for a lovely(diva) friend of mine, I used Victoria by YNS and coloured with my copic markers. A few of the details that cannot be seen in the photograph is the glossy accents on the die cut butterflies and DP, and also the sentiment die that was glittered and burnished. Welcome back friends, wow almost the end of July crazy how this summer is flying by. I do hope you are enjoy your time with family friends. The weather has been much nicer to us this month and we sure appreciate it. As our Winter was so very long, and the spring wasn't that great. But on the bright side it is a wonderful day today, and that is all that counts. 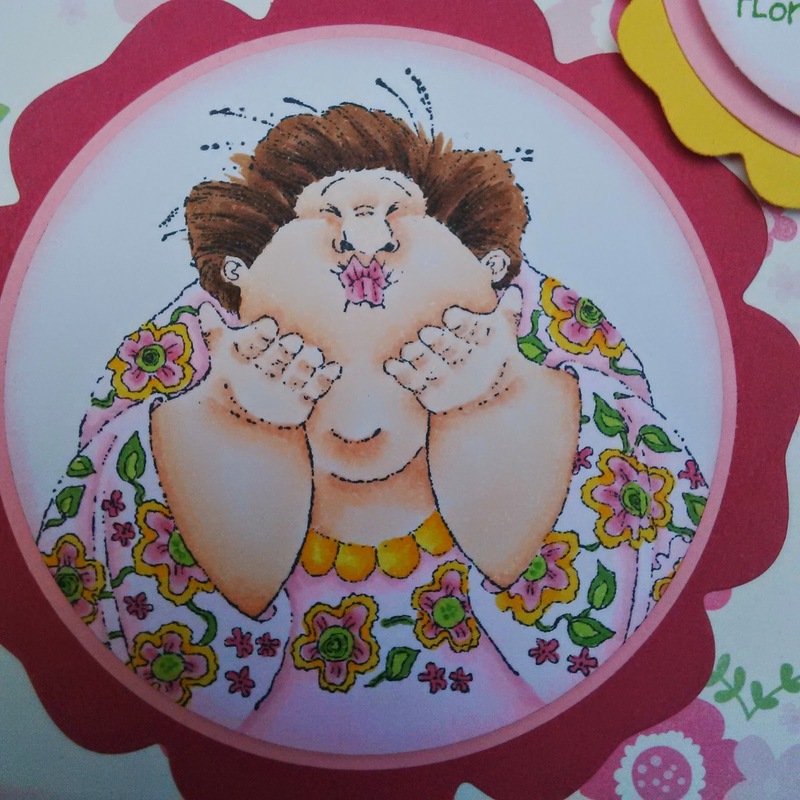 My card today is the last one for July's Inspiration at One Crazy Stamper, I am showcasing another way you can use your dies. If you remember the first post this month I used the Memory Box bridge die I added sparkle and now today, using it again. 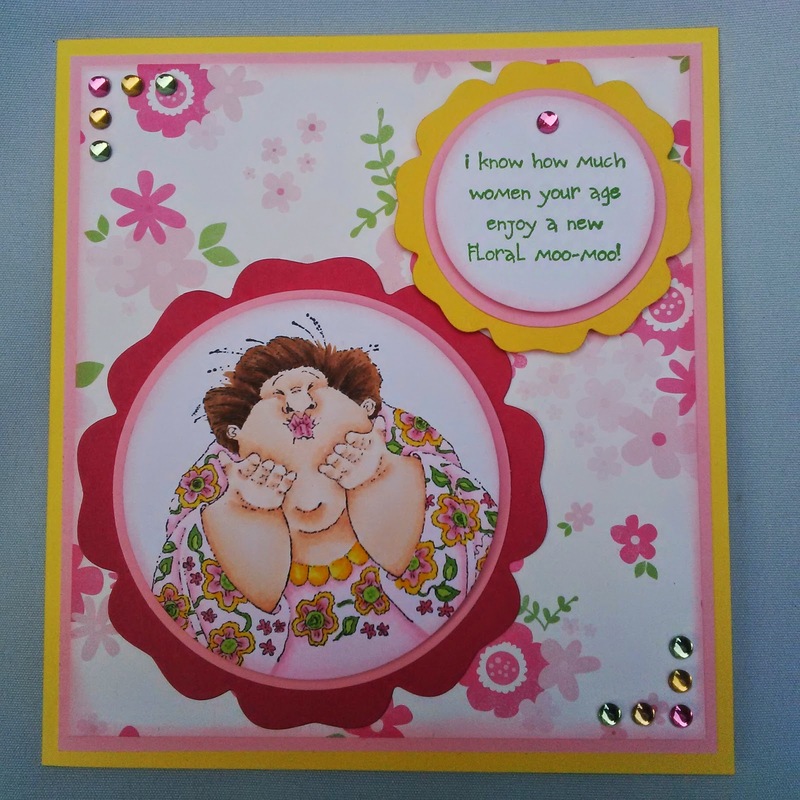 This time I added some versa mark and some white embossing powder, you can't really see it in the photos, but it is there, and then adding some flowers and more dies from spellbinders to finish my card off. I like how you can make these dies all work together and in array of ways. 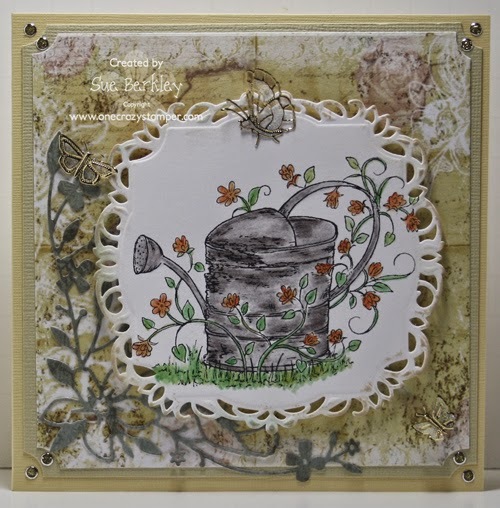 So pop on over to Lora's store she has this Memory Box bridge die, and tons of others. I do hope you get a chance to take in all the Inspirational projects the design team has showcased for you this month, share the love, as we really appreciate a comment or two. Till next time I hope you get crafty! I hope that you enjoyed today post! 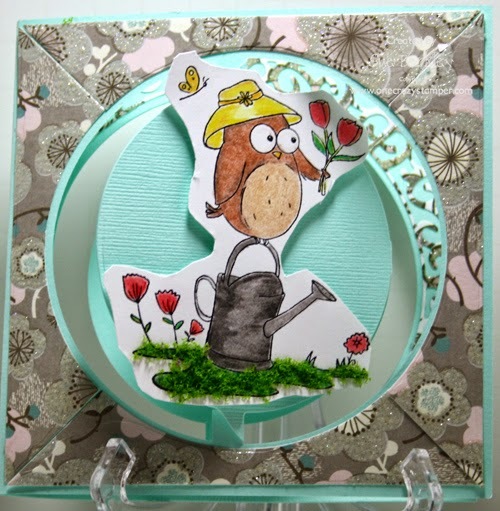 It is Wacky Wednesday again, and for our Inspirational July here at One Crazy Stamper I am showcasing a Heartfelt Creations stamp called Vintage Watering Can. 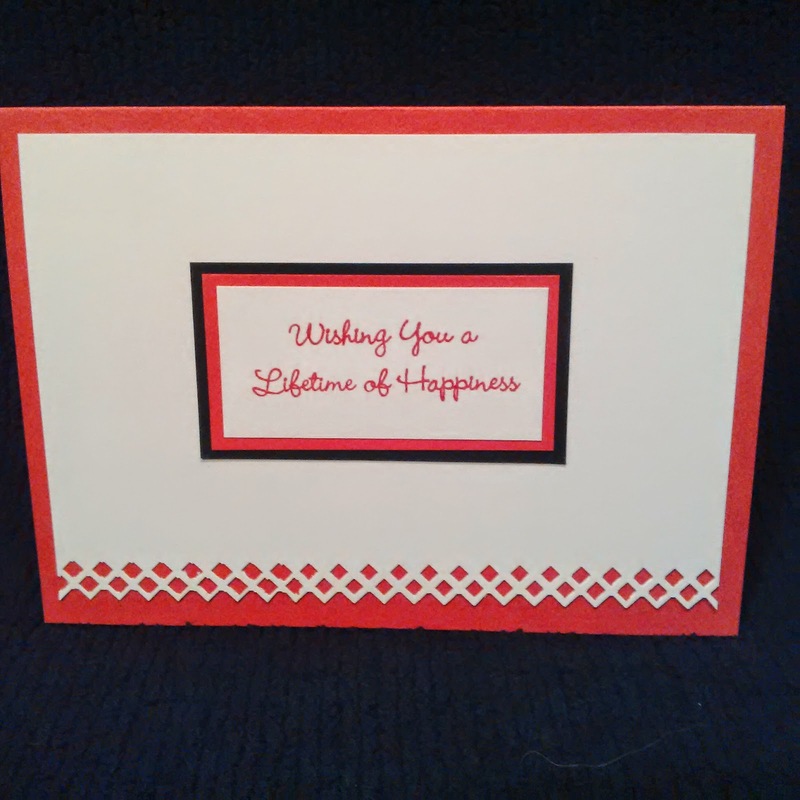 As this is a versatile card and can be used as a "Birthday", or "Thinking of You", or "Sending Happy Thoughts", or "Wishing you Well" type of card, I decided not to add a sentiment at this time. Do you check the rest of the OCS DT posts for more inspiration. Also check out Lora's store OCS for some amazing sales and the PreOrder Section as tons of new products will be arriving. Until next time keep crafting, have fun and don't be afraid to try something new whether it be a new product or technique. Hello! Terrific Tuesday is here, and I'm sharing "Mary" again. This time I've coloured her with copic markers, a few prisma pencils and done in a completely different colour scheme. Check my post here to see her done with only prisma pencils. What do you guys think...which one do you prefer?? 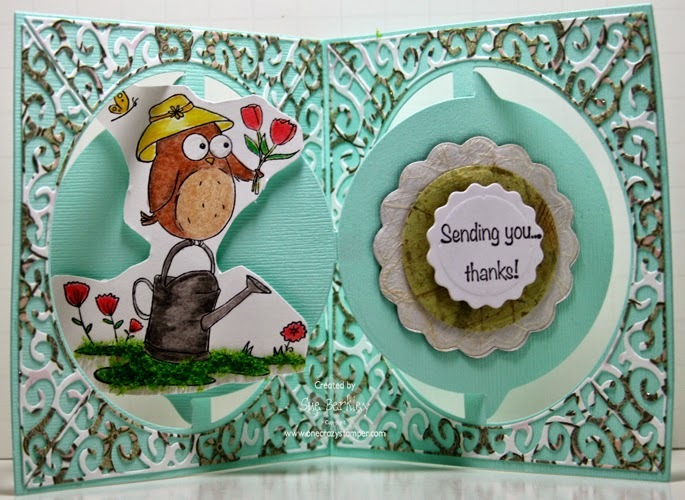 Good day friends, another fantastic stamp from Your Next Stamp called Howdy Farmer! 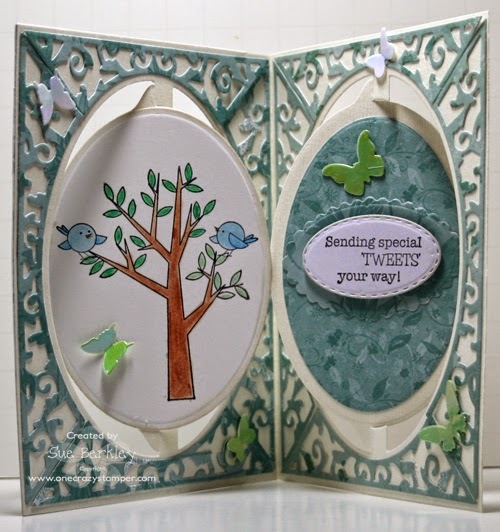 I am showcasing for our Inspirational July here at One Crazy Stamper, and there is tons of inspiration from the design team, so come back and check things out. I had fun coloring this little farmer girl, she was pretty sweet. I used spellbinders, and a banner punch, added some ribbon, some glossy accents on the corn and of coursed colored using my Copic markers. I hope you get a chance to pop over to Lora's Store for some much needed supplies, and till next time, happy crafting! Here is a close up of the beautiful flower. 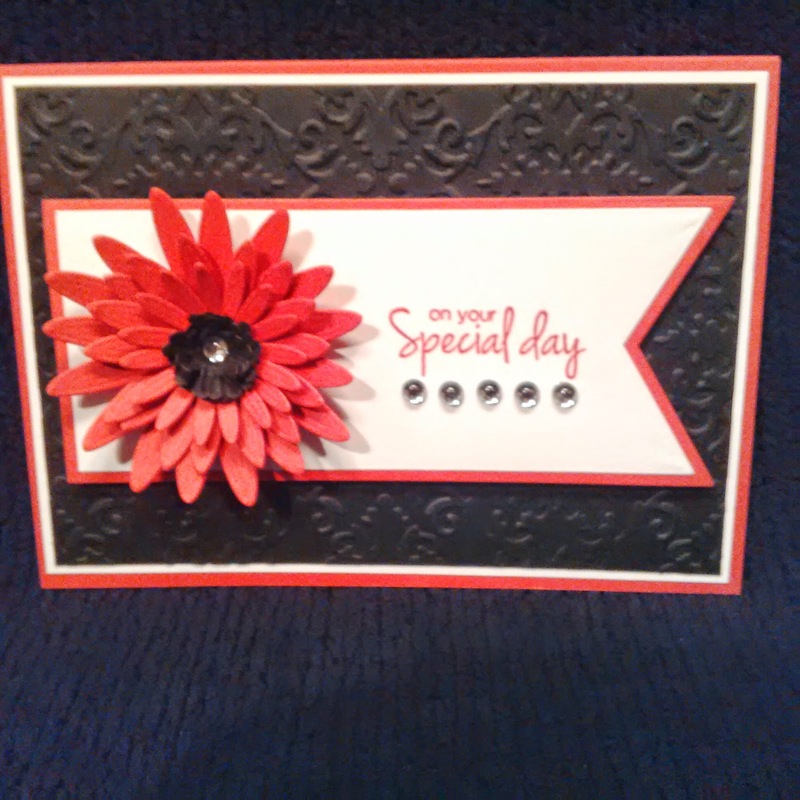 This is a D-Lite die from Spellbinder called Gerber Daisy - Oh my Goodness I LOVE this die so much and it is so fun to play with!!! * Embossing Folder for the back ground. 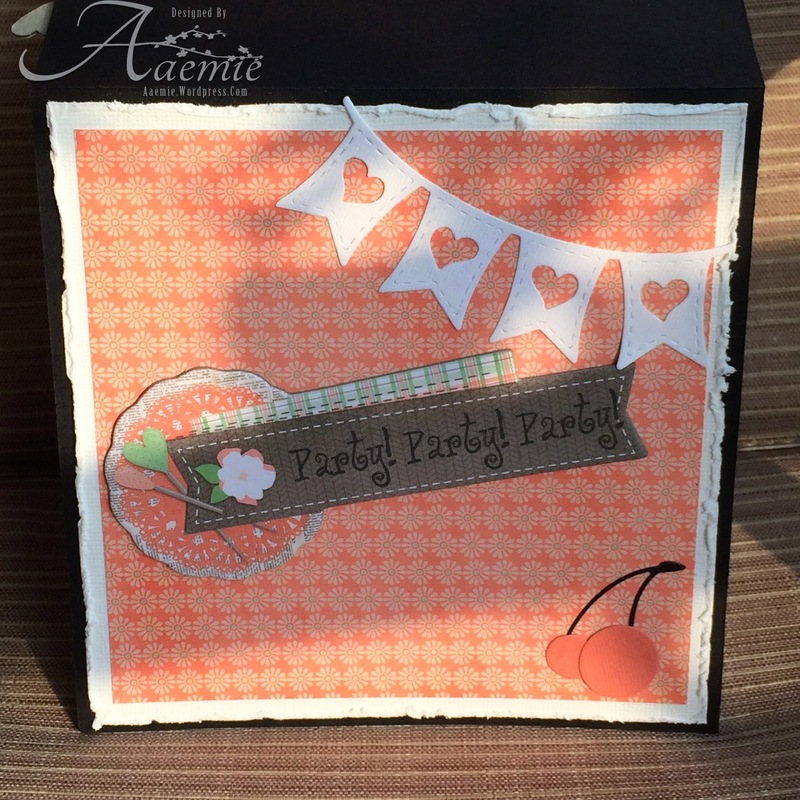 One Crazy Stamper has sooo many fun and playful Embossing folders - check them out here! 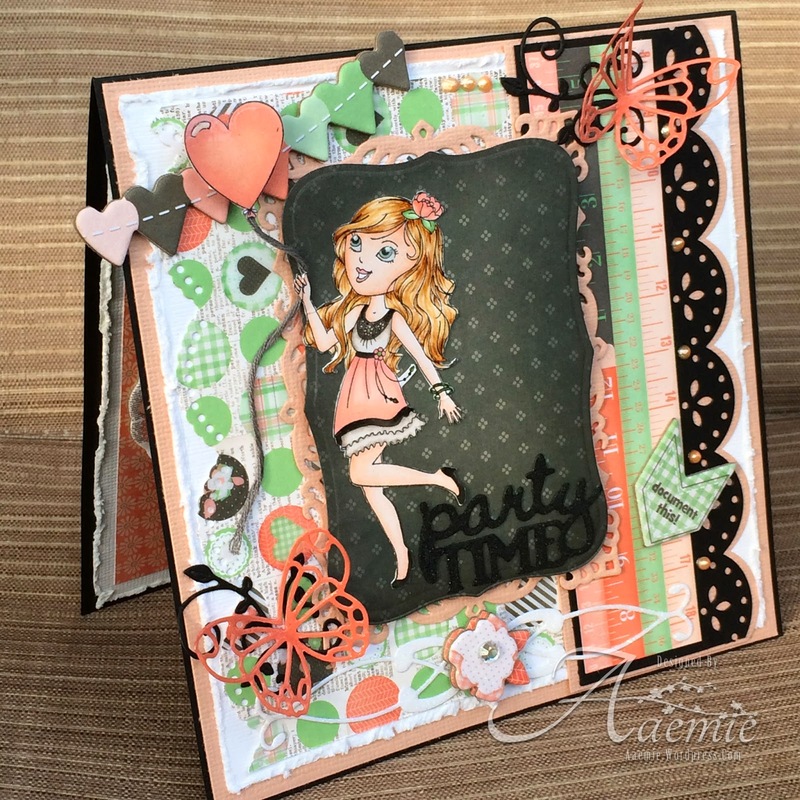 * My Favorite Things Die-Namics - check out all the fun shapes and dies at One Crazy Stamper here! * Forever in Time Pearl Gems, Dainty - I am so in love with these Gems as you probably have noticed on my past posts. They are always just the right size and add so much "sparkle" to any project! I sure hope you enjoyed today post, I would love to hear your thoughts! 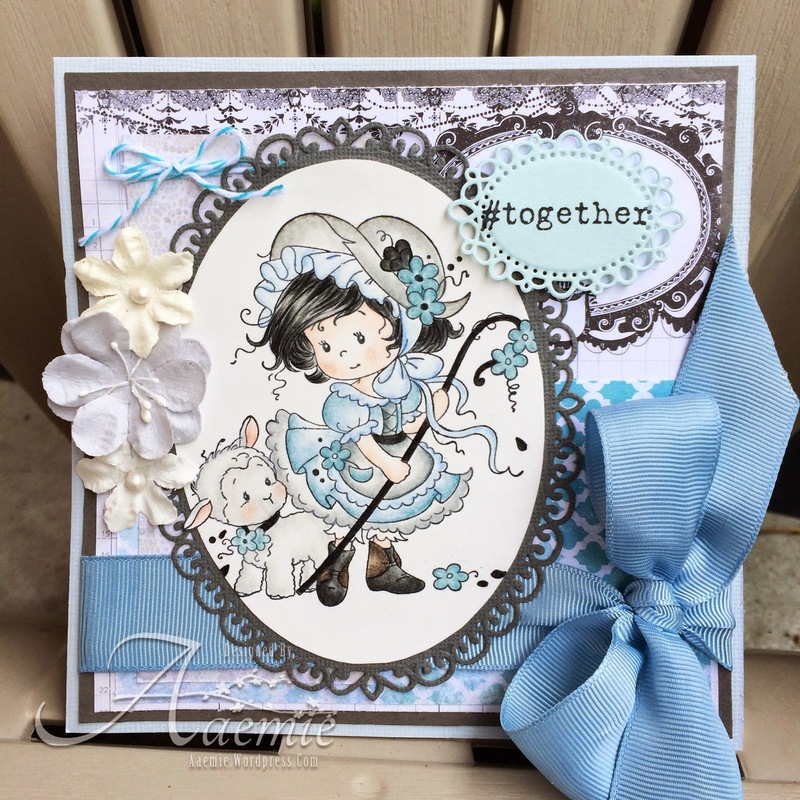 It is Inspirational Month here at OCS, and for today's post I have used this adorable stamp set called Dynamic Duo (Your Next Stamp) and the Accordian Oval Card Die Set and Oval Flourish Frame Edges from Elizabeth Craft Designs. 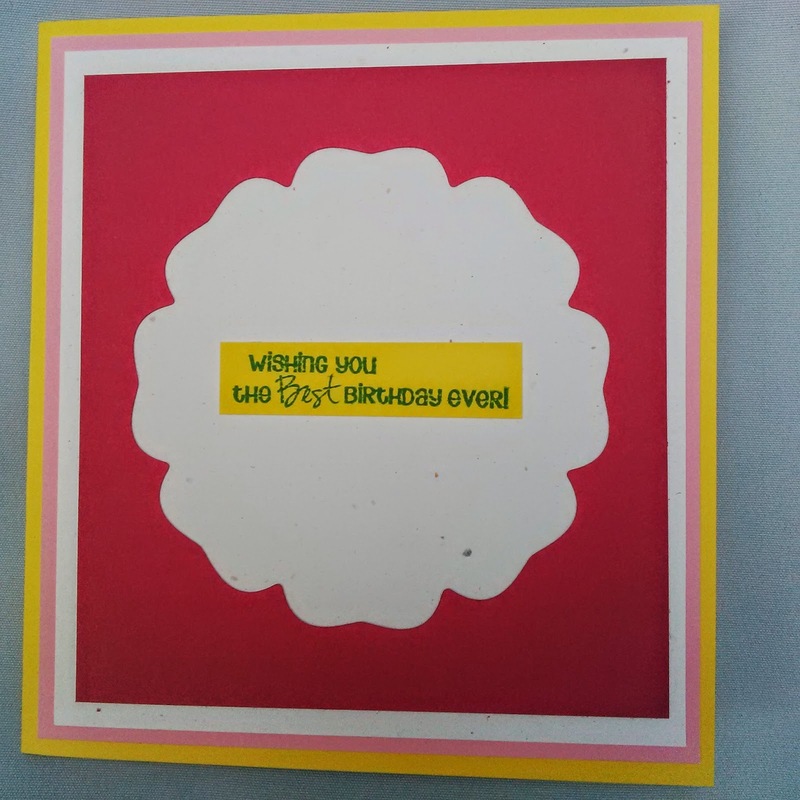 The edges were used to decorate the two panels of the card. This is what the card looks like when it is opened up. This is the front of the card when it is closed. This was the first time that I had use these dies and they are kind of neat for the pop up effects. I still need to work at them, and the adhesive that I used didn't seem to adhe very well. Stop by Lora's store for any supplies that you might need or would like/want. I hope you have gotten some inspiration and be happy crafting something creative. Until next time happy crafting. Hello crafty peeps! I'm sharing a cute as can be creation that is coloured completely in prismacolour pencils and decorated simply with just a few flowers and large bow. 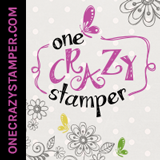 Howdy friends, another fun stamp company I am showcasing for our Inspirational Month of July here at One Crazy Stamper. The image I am using today is from Your Next Stamp called Howdy Farmer. Super cute, and this rubber stamp has the funniest sentiments along with it. I colored my image with copic markers, added some ribbon and pearls. I used MS leaf branch punch, I used La-La-Land banner die, and Bo Bunny - Lemonade Stand pattern paper. I hope you get into your craft room and create with us, please stop back to One Crazy Stamper for more inspiration. Stop by Lora's store for some supplies to! Thanks again for stopping, till next time Happy Crafting! 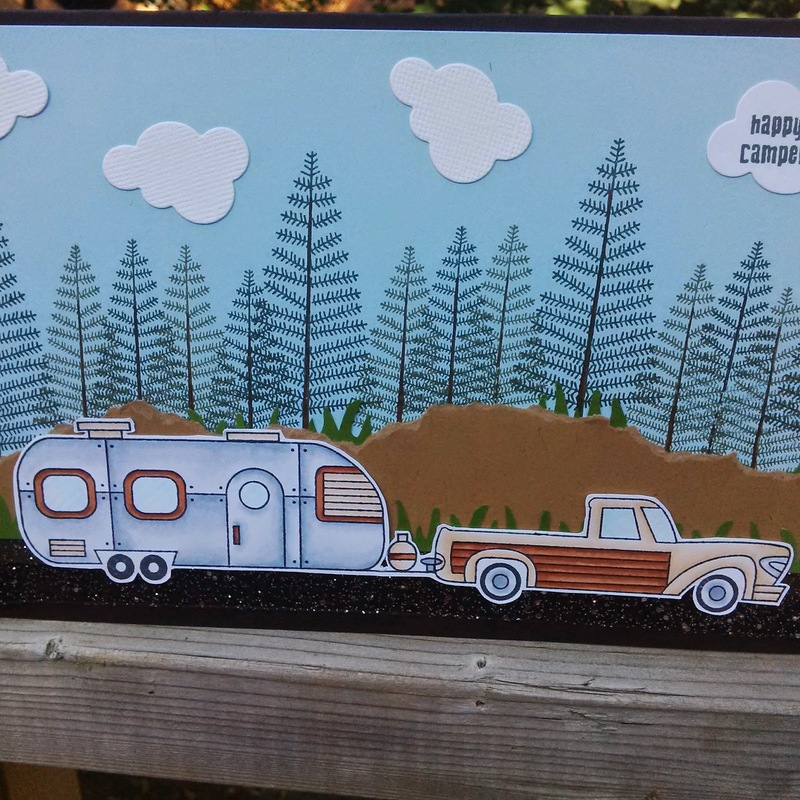 For this card I stamped the Car but made it into a single pick up truck, then I stamped the long trailer to attach to the truck. Once I coloured these two images I then fussy cut them out. 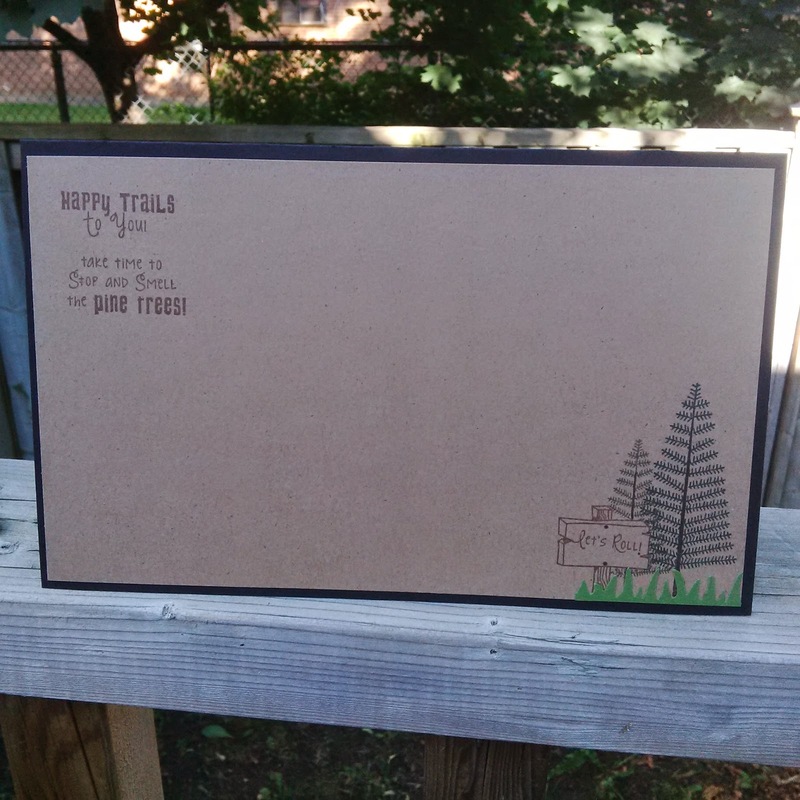 I took Kraft cardstock and ripped it to make the ground background then I took the two sizes of pine tree stamps in the set and created a forest along the road way. 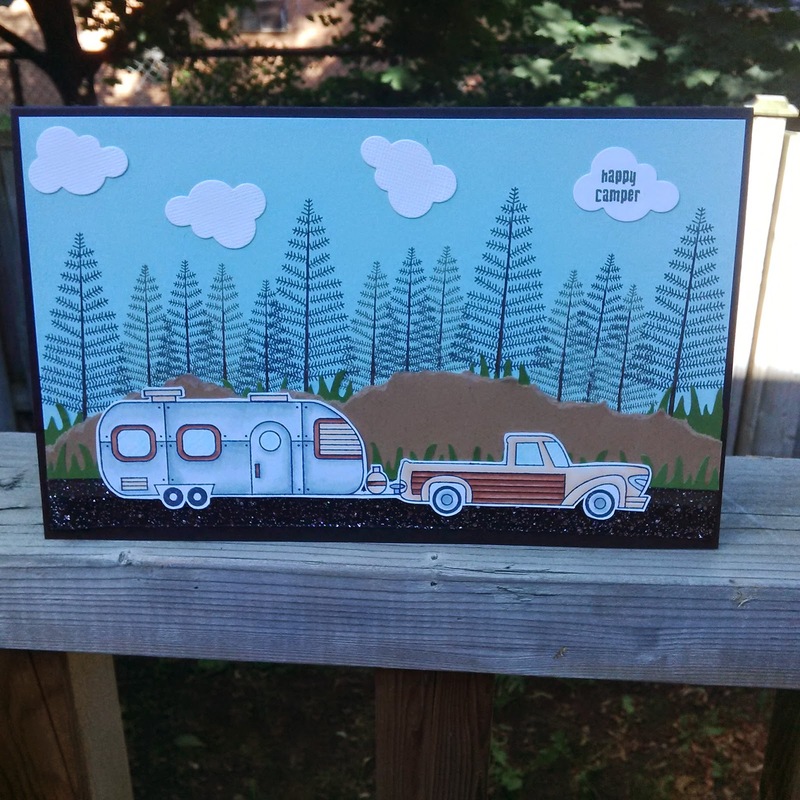 I used Black sparkly ribbon to create the asphalt and die cut the clouds and grass to create this awesome scene. Wishing you a Magical Day!!! 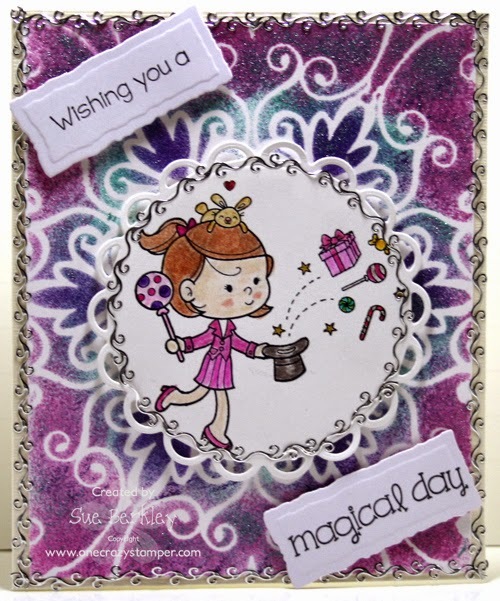 Wacky Wednesday has rolled around again, and for my post for OCS, I have used adorable stamp called "Magical Birthday" from Your Next Stamp. I used the Heartwood Stencil from Memory Box as a background. I coloured it with 3D Stamp Paint (Viva Decor), and used a Peel Off Sticker for inside the circle and around the outside. I used the new Spectrum Noir Pencils which are very easy to use and give nice results. They are currently out of stock, but I understand from Lora that more are on the way. Do check out what the rest of the OCS Design Team is doing for the month of July. This is a Creative Inspiration month and we sure hope we are giving you inspiration to be creative. For any supplies you need, hop over to Lora's OCS store and see all the new products arriving daily. Until next time, keep crafting. 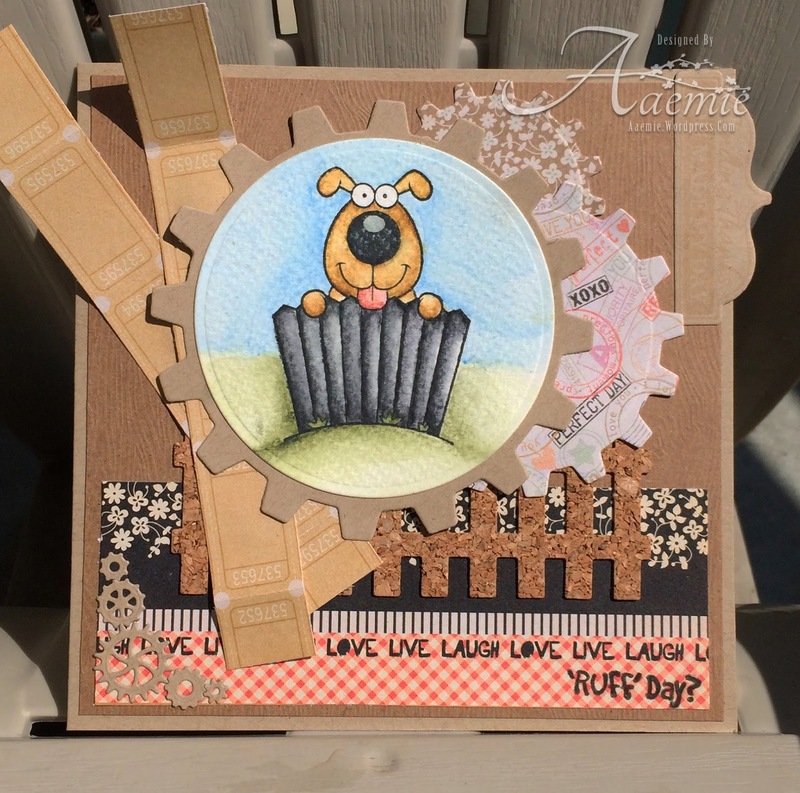 Terrific Tuesday is here and I'm sharing my creation made with "I Ruff You". I water coloured this pup using my derwent inktense pencils, added in a cork die cut fence and some DP from the VERY FIRST paper pack that I had ever bought! I also used Bazzil kraft paper and woodgrain cardstock by American Crafts, anyone else completely obsessed with woodgrain like me? I hope you all like it and it inspires you to go get crafty! Hello Monday friends, and I have another inspirational card to share with you. This one is very special for me. As I was lucky to have a young girl craft with me, she is only 12, and I think she will be coloring beyond me soon, if not already. I said I would make the card, if she colored and so we crafted this one together. Thank you very much girlie, and anytime you want to craft again with me, I would be honored. The stamp I am show casing today for our Inspirational month at One Crazy Stamper is called Birthday cone from Stampendous. So awesome, and I added some ribbon/flowers a sentiment from Whimsy Stamps called-Simple Sentiments. I also used Spellbinders and some 3D Foam tape to pop this wonderful cute image up. Added some Wink of Stella clear over the candles and the ice cream for sparkle oh and on the hats too. I do hope you get a chance to see all the wonderful creations at One Crazy Stamper and to get inspired by our fantabulouso design team, and get crafty too, maybe with a friend or alone. There is always a good time to get your creative juices flowing. Till next time happy crafting, and for some much needed retail therapy pop over to Lora's store, and get shopping. Cheers!